I just finished a new series of plates in time for Holy Hill Art Farm this Saturday and Sunday. My theme was woodland animals. Though I see bunnies, raccoons, squirrels, and deer in my urban garden here in Wisconsin. Rarely is it just one bunny hopping around in my yard. 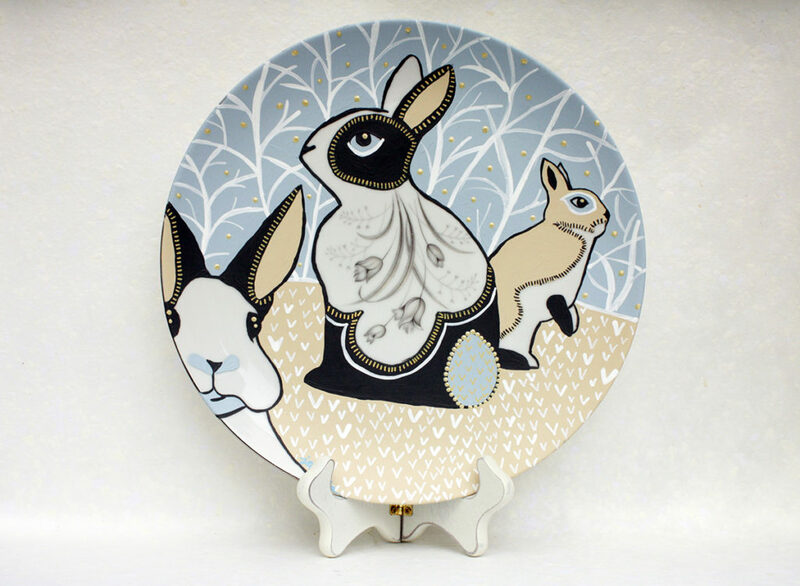 These three curious bunnies are hand-painted on a large dinner plate. The original tulip imprint is incorporated into the middle bunny’s body. This floppy-eared bunny reminds me of the ones I visit at the state fair. 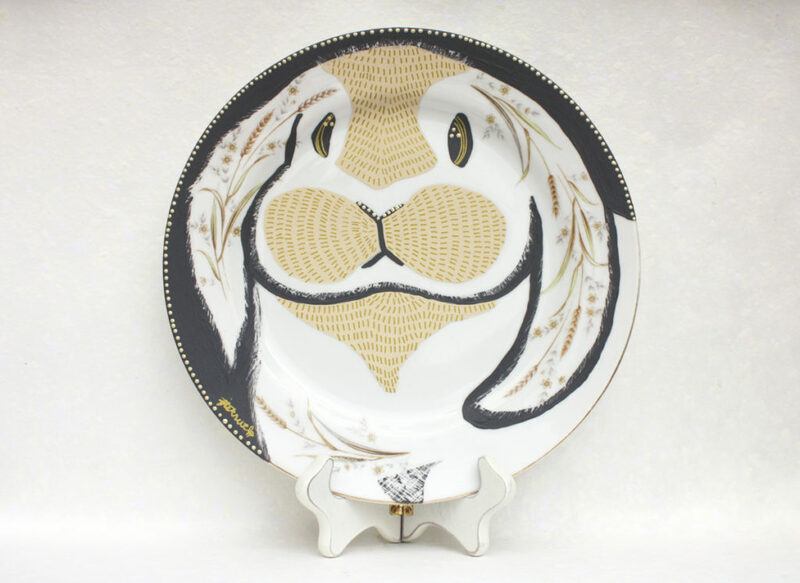 The long ears on this bunny are decorated with the wheat and floral design that encircles this dinner plate’s edge. 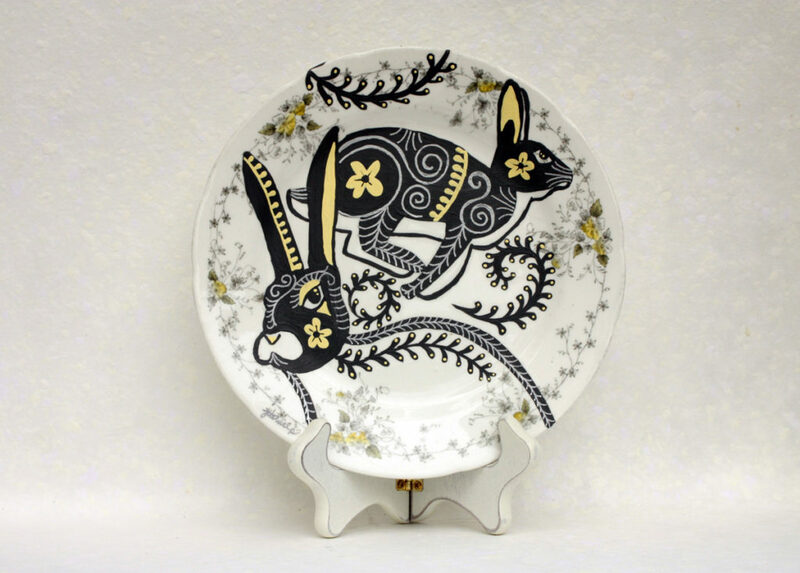 For this small plate I decided to paint a more lively and ornate design. These are jack rabbits and they call for a little more energy as they hop across. This was a very unusual plate that I found at Goodwill. The main design was a reproduction of needlepoint art with a gold art deco pattern around the rim. 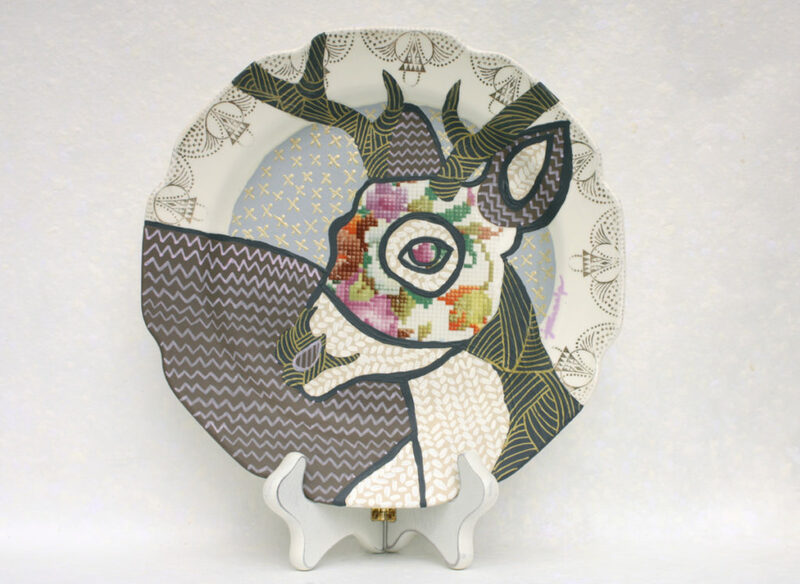 I thought it would be fun to keep the theme going and paint this deer with patterns inspired by yarn art. 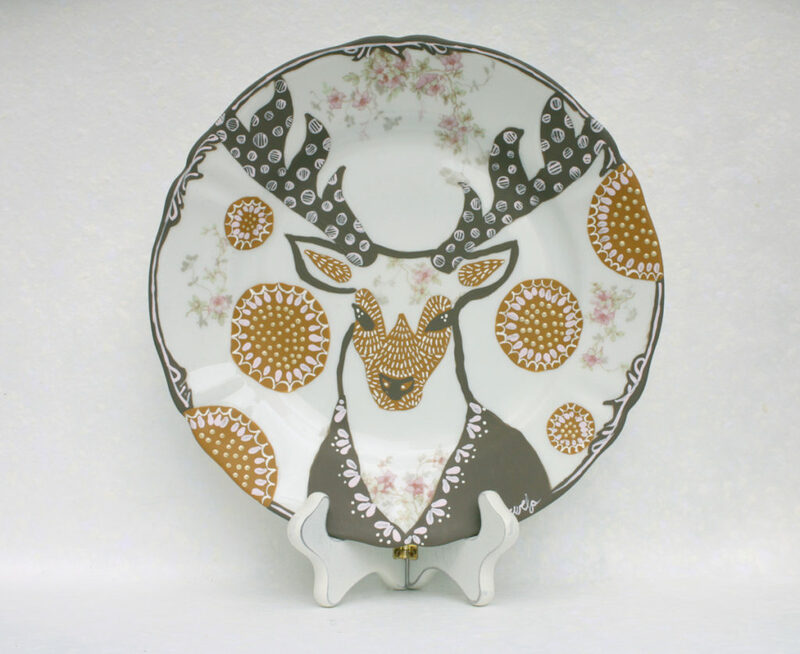 This pretty in pink plate needed a sturdy stag to balance it out. The browns and ochres look beautiful with the pale pinks. He wears pink well, doesn’t he? 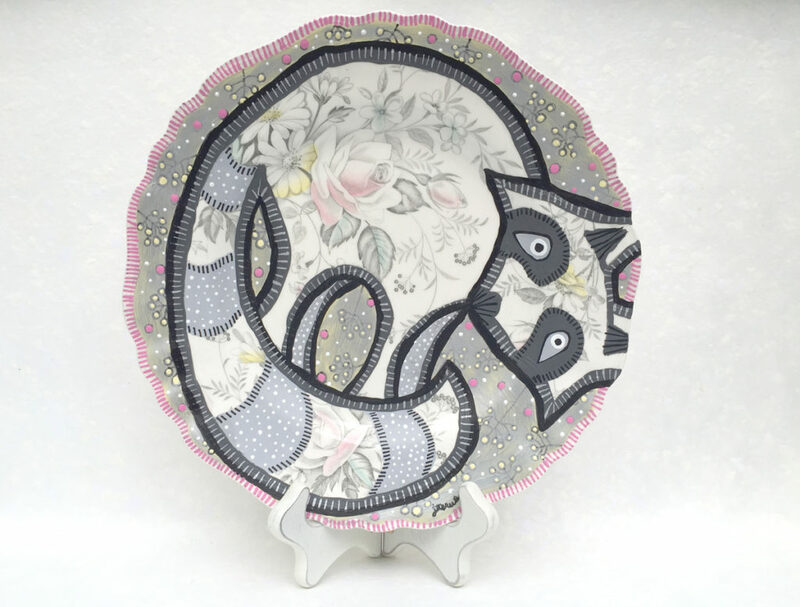 The striking graphic pattern around the rim of this plate inspired me to create a raccoon with similar graphic details. The yellow tones mixed with dark and light grays really pop off the plate. 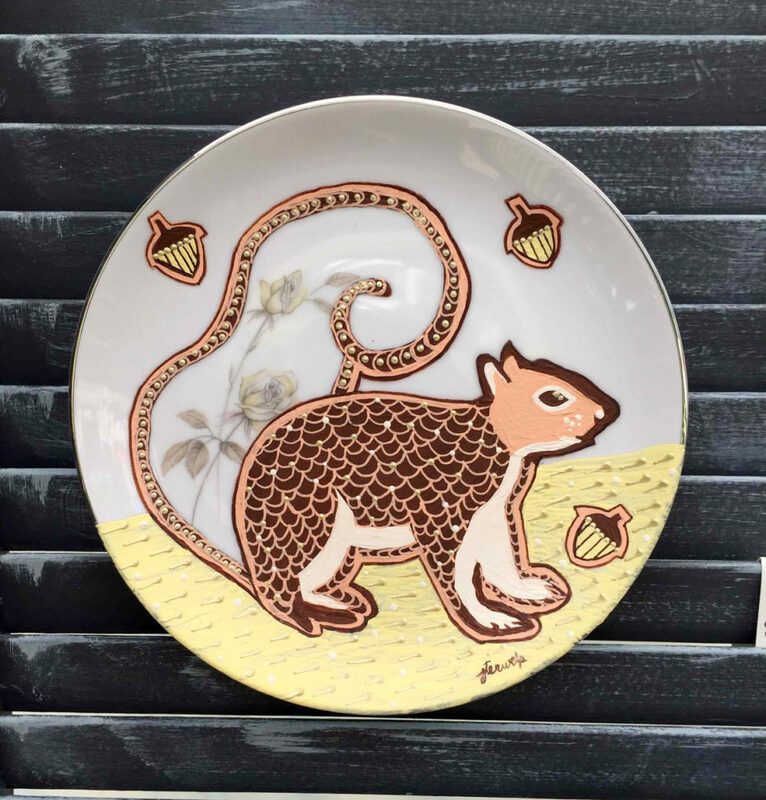 This whimsical creature’s body incorporates the all-over floral pattern on this large plate. The shape of the original floral imprint reminded me of the arching back of a raccoon. I was pleased how I was able to include most of flowers in the body, tail and head of the raccoon. Trying to visualize how I can unite my painting with the original imprint is definitely part of the joy in my art. Another fun example of how I meld the existing design with my own art is shown in this cute squirrel. Yellow roses become part of the design in his tail. 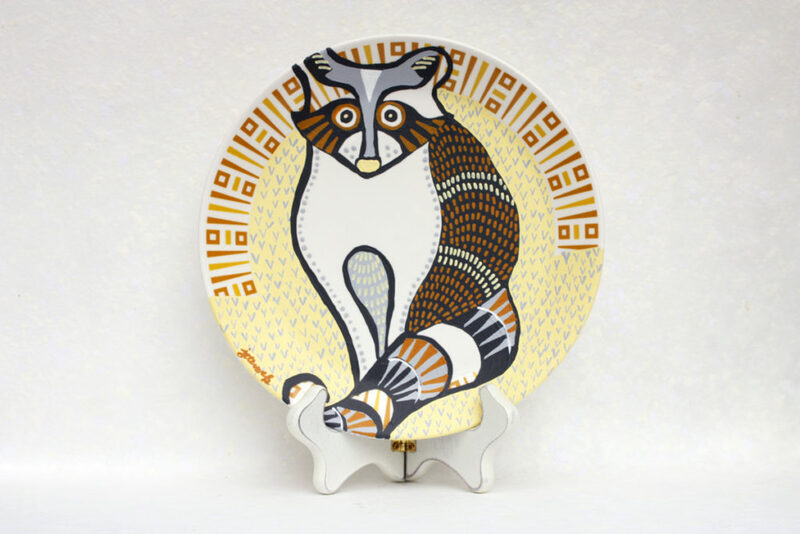 Upcycled hand-painted plates vary in size from 7 to 11 inches in diameter. Price for small plated is $36 and large plates are $48 without tax and shipping. For more information on purchasing my original one-of-a-kind (OOAK) art, please contact me referencing the plate in your email. I can paint a custom unique design in your choice of color scheme on a variety of thrift shop plates. Note that these plates are for decoration only and come ready to hang.